Announces on the 100th Anniversary of the first woman elected to the NYS Assembly, Huntington Suffragist Ida Bunce Sammis. Congressman Tom Suozzi at the former home of suffragist and NYS Assemblywoman, Ida Bunce Sammis in Huntington. Huntington, NY - November 6, 2018 - Today, on the 100th anniversary of the election of the first woman to the New York State Assembly, Congressman Tom Suozzi (D – Long Island, Queens) sent a letter to the United States Postal Service’s Citizens’ Stamp Advisory Committee requesting a commemorative stamp to honor the upcoming 100th anniversary of the 19th Amendment, which gave women the right to vote in federal elections. “In 1848, women, demanding a voice in our government, organized in upstate Seneca Falls, New York, and women’s suffrage became a movement. Seventy-two long years later, the 19th Amendment to the United States Constitution was finally ratified, in 1920. New York State, however, was slightly ahead of the curve, and got it done in 1917, allowing strong women, like Ida Bunce Sammis, to not only exercise their right to vote, but to run for elected office, beginning in 1918. Throughout the history of our country, so many people fought long and hard for the right to vote. Let’s not see their efforts, on our behalf, be in vain,” said Congressman Suozzi. The 19th Amendment to the Constitution was ratified on August 18, 1920, granting women suffrage, or the right to vote. New York State, the birthplace of the women’s suffrage movement, granted women the right to vote in local and state elections on November 6, 1917. One year later, on November 5, 1918, the first-time women could vote in a NYS election, two women were elected to the New York State Assembly; Mary Lilly, from New York City, and Ida Bunce Sammis, from Huntington. 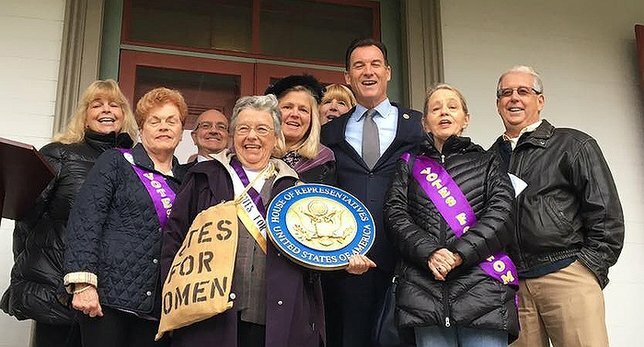 On November 5, 2018, the 100th anniversary of the election of Ida Bunce Sammis to the New York State Assembly, Congressman Suozzi announced his request for a commemorative stamp to honor the 19th Amendment and the local women who were at the forefront of the women’s suffrage movement. The announcement took place at the former home of suffragist and NYS Assemblywoman, Ida Bunce Sammis in Huntington. It was at this home where Ida Sammis held meetings and rallies promoting women’s right to vote. Subject: LongIsland.com - Your Name sent you Article details of "Congressman Suozzi Requests Commemorative Stamp Honoring Women’s Right to Vote"